"where traveling supports your cause." Search from our massive worldwide inventory of over 860,000 hotels. Support your cause when users book travel, at no cost to you! People choose to support a charity for various reasons. Many people donate out of the goodness of their heart and the desire to help others in need. Others give to charity because they themselves need, or have needed, the support of a specific charity, or the charity has helped a family or friend. In addition to these reasons, you may also donate to claim tax deduction, improve your image as a charitable person or feel part of a community and the list goes on and on. Many charities rely entirely on the generosity of the general public and businesses to enable them to continue the essential work that they do. Whatever the reasons for offering support to a charity, this is what keeps them going. In current economic times it is not easy to run a charity or fund raiser and we want to help these organizations in need of funds by offering an extra opportunity to support their important work. That is why we formed CauseTravel.com; so that by doing something your supporters are already doing, at the same guaranteed low price, funds can go directly to your cause or charity from every booking made. 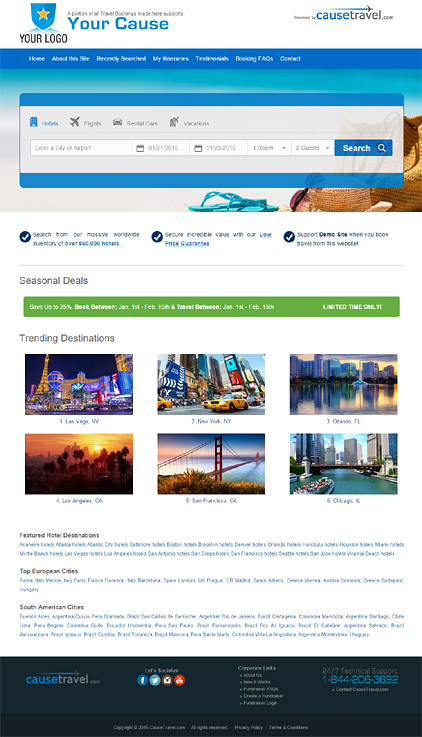 By simply booking through your CauseTravel.com website your supporters can provided additional resources directly into your hands at no extra cost to them. People tend to think there is nothing they can do to help solve world problems, but that is far from correct. You can now make a difference by booking a hotel! So why not have your supporters book their hotels through your CauseTravel.com website? We really can’t think of any reason not to. Want to see how it works? Click Here to check out our live demo site. You will receive up to 10 hours of dedicated support from our marketing team. Roll out a CauseTravel.com supplemental funds generator in a meaningful way to your members. Q: Is booking travel on CauseTravel.com more expensive than other hotel booking sites? Q: Is the exact amount to be received confirmed at the time of booking? A: The exact amount of the donation will be confirmed as soon as the booking is fully completed, which is when the traveler checks out of their hotel. Once this has been completed we will then post the amount to your account and send you the traveler an email with the exact amount of money transferred from their respective booking. A: Signing up as an organization/charity/cause is very easy. We just need contact details, a logo and a short text with a description of the organization/charity/cause. Every organization/charity/cause can join CauseTravel.com as long as they have a person responsible for the management of the organization. Q: How do I track my organization/charity/cause earnings? Q: How soon do I see my earnings in my account? A: If your question isn’t listed here please contact us directly at support@causetravel.com. There's absolutely NO COST to your organization to get started! Satisfy your curiosity... Click Here to check out our live demo site. Create your own Travel Fundraiser site in under 5 minutes. Nothing to purchase, no coding, nothing to pre-buy. Just complete the Registration Form and we will create your very own travel booking site and have you raising additional funds for your cause within 72 hours.